Embassy Suites by Hilton is a brand within the Hilton Worldwide portfolio that promises to provide what really matters most to the savvy guest. 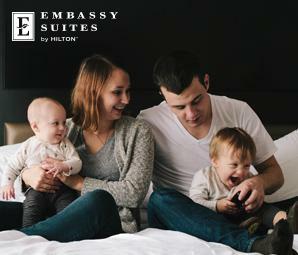 Several of our bloggers took a family getaway to experience Embassy Suites by Hilton. See everything they had to say and comment for your chance to win a $100 Visa gift card! Travel More Part 1 Sweepstakes on BlogHer runs from 4/20/2016 through 5/20/2016 and is only open to individuals who, at the time of entry deadline, are legal residents of the United States and are 18 years or older. Click “here” to read the official rules. Winners will be randomly selected from all eligible entries. Good luck! Travel More Part 2 Sweepstakes on BlogHer runs from 5/25/2016 through 6/25/2016 and is only open to individuals who, at the time of entry deadline, are legal residents of the United States and are 18 years or older. Click “here” to read the official rules. Winners will be randomly selected from all eligible entries. Good luck! Travel More Part 3 Sweepstakes on BlogHer runs from 6/6/2016 through 7/6/2016 and is only open to individuals who, at the time of entry deadline, are legal residents of the United States and are 18 years or older. Click “here” to read the official rules. Winners will be randomly selected from all eligible entries. Good luck! Travel More Part 4 Sweepstakes on BlogHer runs from 6/9/2016 through 7/9/2016 and is only open to individuals who, at the time of entry deadline, are legal residents of the United States and are 18 years or older. Click “here” to read the official rules. Winners will be randomly selected from all eligible entries. Good luck!